Please note: Discraft Inc. cannot print any copyrighted material without the written consent of the author, artist, or designer. If you use any copyrighted material in your design, you'll need to obtain a copyright release from the owner and submit it with your artwork. Examples of copyrighted material include cartoon characters, corporate logos, artwork from films, and school mascots. 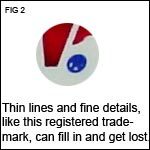 Remember that you can't use the term "frisbee" in your design either, as it is a registered trademark of another company. If you're designing for a hot stamp, read the entire page. Please read carefully: This may look like a lot to go through, but taking a few minutes to digest this info now will help you create the best design possible. Set your art creation software to 300 dots per inch (dpi), then view an actual size image of our design sample If you chose to put a black reference ring down to aid your design, be sure to remove it before sending us your artwork or it it will be printed on your discs. Let's face it: not everyone is an artist. If you fall into that category, Discraft is here to help. Our art department is available to help bring your design to life. Charges are $40 per hour for hotstamp art, $60 per hour for Supercolor designs. Work can typically be completed in under two hours. 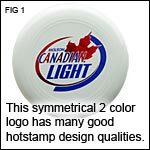 Symmetrical designs (FIG 1) make better hot stamps than non-symmetrical. In other words, try to keep a balance of color and open space throughout the design. And most importantly, the design should never cover more than 50 percent of the printing area. Thin lines had a tendency not to print. Please keep all lines at least 1mm thick. Super fine details are generally not suggested for hot stamp designs (FIG 2). This is also true of "reversed" lines (where the background is the stamping color, and the line is actually the disc color showing through). If an area of non-print is less than 1mm thick, the foil will fill it in and make the area appear solid. More about line size and fill. Very fine points are not recommended since the hot stamp foil may start to peel from that point, or may become rounded or torn. To prevent this, slightly round off all fine points at the ends of lines and in other small shapes. More about fine points. 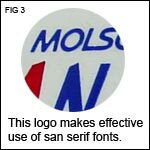 Text should be sans-serif (that's flat or rounded edges, as opposed to 'serif' fonts, which tend to have pointed edges) and at least 12 points in size (FIG 3). Serif fonts do not print well since the serifs are so fine. if you choose a serif font, it must be bold and at least 28 points. If a text style is especially funky, with extra flourishes or unorthodox letter shapes, it may need to be a little larger than stated above. Reverse text (the underlying disc color "showing through" a solid printed area) should be a little larger than 20 points and bold so it doesn't fill in. With reverse text, the bigger the better. It is best to avoid outlining text on two color designs. If your design includes a significant amount of outlining on text or other elements, you will be required to sign a line-up waiver before we will be able to process your order. Hot stamp printing is sort of like placing a sticker on the disc surface (albeit much more permanent! ): if an air bubble were to get under your sticker, it would create a flaw. Same for hot stamping. 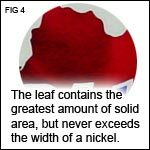 To get around this problem, the largest solid areas in your design cannot exceed one-half inch (12mm) square, or about the size of a nickel (FIG 4). This is probably the most significant limitation in hot stamp printing. Keep solid areas away from the center if possible, otherwise we may ask you to sign a center waiver before processing your order. If your design depends on large solid areas, you can break them up using fill patterns such as lines, dots, waves, etc. Please make sure the dots or lines are not too small; a minimum of 25 dots per inch is recommended for fill patterns, and lines should comply with the line thickness specs above. Fill patterns should have a 50/50 break up. Each color of your design should be in a separate file or on a separate layer within the same file. If submitting as separate files, please include registration marks on a multi-color design. The easiest registration mark to make is an "X". Place the registration mark on each file in the same place. Put the mark in at least two corners outside of the imprint area. Registration marks are not necessary if you are sending your art as one file utilizing different layers (such as with a Photoshop file). Art should arrive to us in all black, and include a color composite for reference. More about two color setups. We are unable to process multi-color designs that have tight registration or overlapping colors, since some shifting will occur and foils are not designed to adhere to other foils. The closest the two colors should be is 1/16 of an inch / .13 cm (4.5 points) to each other. 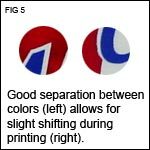 The gap between colors ensures that there's a small amount of room for the layers to move without the colors printing on top of each other (FIG 5). More about layer shifting. All artwork will be printed in the center of the disc, unless otherwise specified. If your design is not circular or is smaller than the maximum printing indicate where you would like the design placed on the disc (within the maximum printing area). Hot stamp printing requires the use special stamping foils, which are only available in a limited number of colors. As a result, we cannot match Pantone or PMS color codes. Please view the foil color options and let us know what you decide. Creating your design at the correct size (or larger) is important. Feel free to make your design slightly larger, as we can always shrink it down with no loss of picture quality (whereas enlarging a design that is smaller than the sizes in the above table will result in significant loss of quality). Remember to create it in high resolution, at least 300 dpi. More about high vs. low resolution. Please note that submitted art which is sized smaller than the printable area will be enlarged to the printable area unless you specifically inform us otherwise. The Discraft Supercolor process utilizes CMYK digital printing output; we are unable to provide exact (spot) color or Pantone matching. 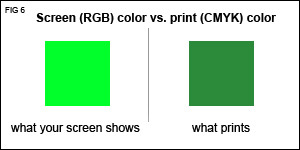 Also note that colors you see on your computer screen may not be reproducible with CMYK printing. For example, a neon green on your screen will print closer to a kelly green, and will appear more flat than bright (FIG 6). To ensure your Supercolor discs look at good as possible, read this article on designing for print. Our Full Print Supercolor method requires 1/4 inch of bleed in the design. During production your art will be sized to an 11inch diameter and then trimmed down to 10.5inches, losing 1/4 inch of art around all sides. For designs with a plain color background, or designs with irregular shapes that would suffer from being trimmed, our production staff can add the bleed for best printing. Please do not include text or design elements that you would not want trimmed within the outermost 1/4 inch of the art. Adding a bleed is not necessary for Center Print, Golf, or Mini Supercolor designs. Almost anything goes. feel free to put any wacky thing you would like in your design, but please avoid drug references, sexually explicit, obscene, or vulgar language and images. Discraft reserves the right to refuse to print any design that does not meet our acceptable content standards. Discraft Inc. cannot print any copyrighted material without the written consent of the author, artist, or designer. If you use any copyrighted material in your design, you'll need to obtain a copyright release from the owner and submit it with your artwork. Examples of copyrighted material include cartoon characters, corporate logos, and school mascots. We also need a release from your school if you use its name in your design (for example "University of Michigan"). 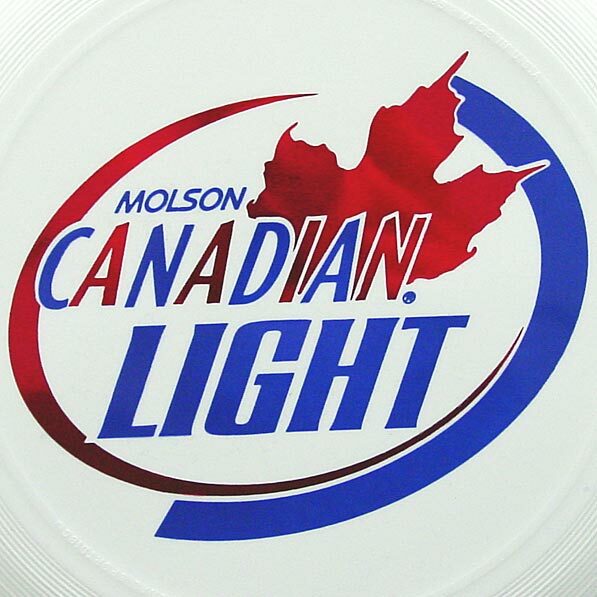 Remember that you can't use the term "frisbee" in your design either, as it is a registered trademark of another company. It is Discraft's responsibility to determine if your artwork is properly designed in accordance with these guidelines to ensure a quality printing job. It is the customer's responsibility to proofread the design for any spelling or other content errors. If you're having trouble meeting our printing specs, the Discraft Art Department can help! Art revision fees are $40/hour for hotstamp, $60/hour for Supercolor. We typically need only one or two hours to wrangle your art into shape. Drop us a line for more info. If you need a complete design from scratch we ask that you find a third party artist to assist you. IMPORTANT: Please do not send your art until we ask for it. You'll need to fill out an order form and receive a quote from Discraft prior to sending your art. It is preferred that the artwork is submitted as a digital file, in a format such as Photoshop, Illustrator, EPS, TIFF, PDF, or BMP. We can accept formats for either Mac or PC. If sending a JPG, it should be no less than 300 dpi and saved using your program's 'high quality' setting. Please do not submit screenshots, 72 dpi JPG or other low resolution file formats. When submitting digital art, please compress it using a compression program such as Zip or StuffIt before emailing. Send Ultimate art here, or Disc Golf art here. You can submit an order form by fax, and if so you can also fax your design for approval. Faxed art is not suitable as final art. Our fax number is 248-624-2310. If sending by mail, we prefer that you use priority mail. Please send it to us unfolded, and not in a letter-sized envelope. Each layer should be in black ink, with the desired final color indicated in a separate composite or notes.